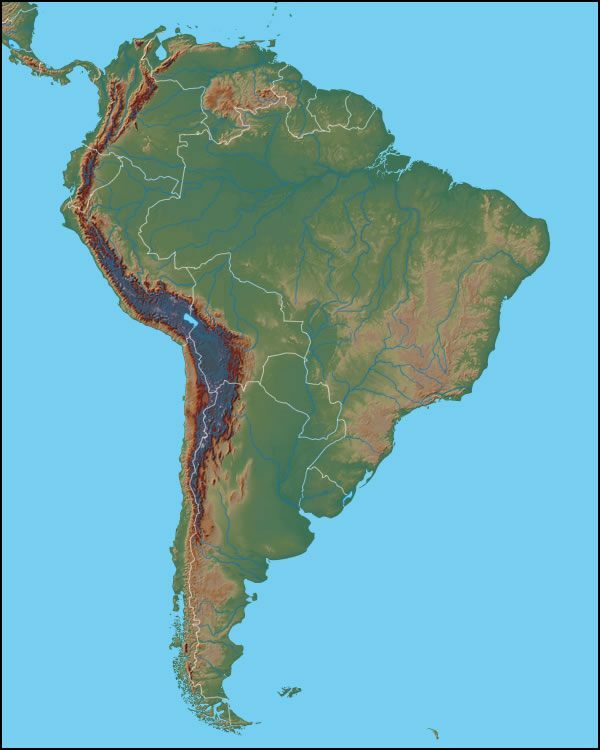 The map above reveals the physical landscape of the South American Continent. Important mountainous areas are the Brazilian Highlands, the Guiana Highlands, the Serra Dois Irmaos and the Serra Grande. The most mountainous area is on the western side of the continent. Topography there is dominated by the Andes Mountains. Other important ranges include the Cordillera de Merida, the Coast Range, the Cordillera Oriental and the Cordillera Occidental. Major South American lakes include Lake Maracaibo in Venezuela and Lake Titicaca in Peru.